Former Sri Lankan President Mahinda Rajapaksa has been sworn in as prime minister after the country’s president sacked incumbent Ranil Wickremesinghe, in a surprise move that threatens political turmoil in the Indian Ocean nation. The appointment was confirmed in a statement from President Maithripala Sirisena’s office on Friday, but Wickremesinghe later told local media that he remained the prime minister. “I retain the confidence of the house. I am the prime minister and I have the majority,” Wickremesinghe said. The move ends a more than three-year-old coalition government that was formed on promises of economic reform and accountability for alleged atrocities committed during Rajapaksa’s 10-year rule at the close of Sri Lanka‘s bloody civil war. Sirisena, who was health minister under Rajapaksa, joined forces with Wickremesinghe to defeat the former president in elections in January 2015. He was elected as president largely thanks to the backing of Wickremesinghe’s United National Party (UNP). At the time, Colombo was facing economic sanctions from Western countries over Rajapaksa’s human rights record. Earlier on Friday, Sirisensa’s United People’s Freedom Alliance had said it would quit the ruling coalition. Relations between Sirisena and Wickremesinghe have soured since their parties suffered humiliating losses in February’s local council elections. Sirisena is also believed to be behind a failed attempt to impeach Wickremesinghe in April. The ruling coalition has been further strained in recent days by strong criticism from Sirisena and his allies that ministers from Wickremesinghe’s party did not act properly in investigating an alleged assassination plot to kill the president and former Defence Secretary Gotabaya Rajapaksa, the new prime minister’s younger brother. 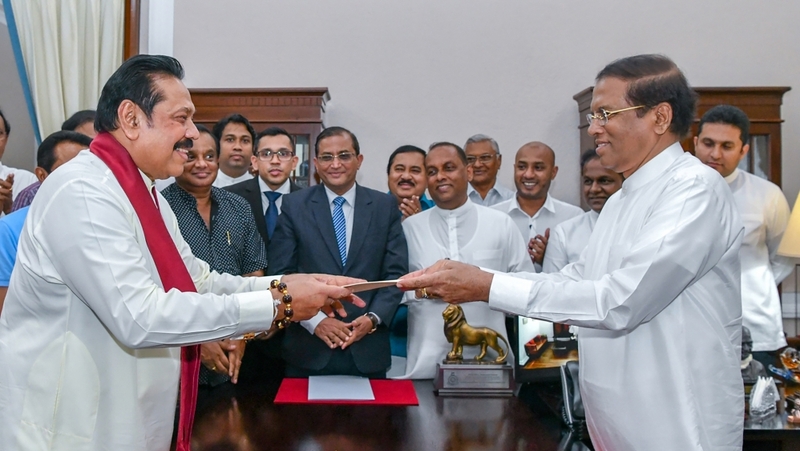 Mahinda Amaraweera, a presidential aide, told The Associated Press news agency that Rajapaksa has the majority needed in the 225-member parliament to run a stable government. Al Jazeera’s Minelle Fernandez, reporting from Colombo, said Rajapaksa’s shock appointment has brought uncertainty to Sri Lanka. “There was no inkling that this might happen. It was only after the swearing-in that we started seeing videos and pictures of the ceremony,” she said. Mangala Samaraweera, the finance minister of the outgoing government, labelled Wickremesinghe’s ousting “an anti-democratic coup”. Rajapaksa, who served as president from 2005 to 2015, put down the decades-old Tamil Tiger separatist struggle in May 2009 through a military assault that killed up to 40,000 ethnic Tamil civilians, according to rights groups. His government was also accused of corruption and murdering political opponents. Sirisena had pledged accountability for war atrocities, but has faced international criticism for being slow to deliver on justice.